Our kitchen at work is always stocked with fancy/pretentious/healthy snacks and drinks. I work across the hall from the marketing guy, and he and I are always discussing snack/drink packaging. This afternoon we strolled in for coffee and seltzer, and noticed some new snacks! 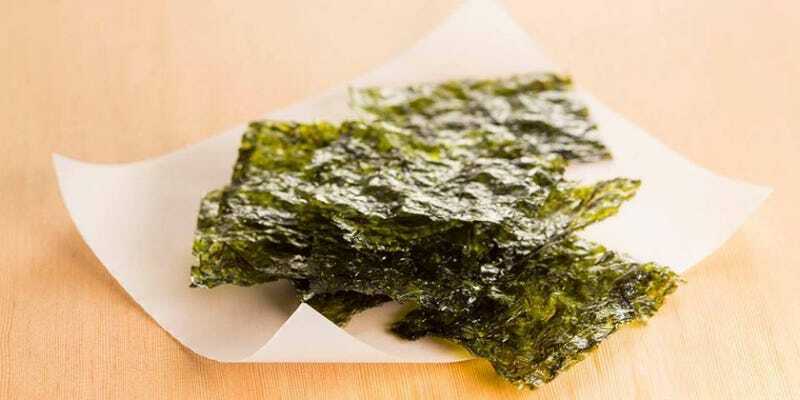 “Seaweed chips! ?” We said in unison. We each picked up a pack and started to laugh. “Is this a joke? No way there is anything in here.” He said as we shook the packaging around. In fact there was a stack of “seaweed chips” in the package just like the ones picture above. I’m waiting for his take on them, but I don’t think I like em. I just ate “chip” number 4, and I don’t think I’m going to make it through the rest. Yep #5 seals the deal, they’re gross.